Martin Luther King Jr.’s actual birth date is January 15th and this year a visit to the African American Museum in Dallas seemed appropriate. After a hefty soul food lunch at Sweet Georgia Brown’s, we decided to also explore the area for signs of MLK’s influence and presence as well as the history of Dallas’ historical black community. Many towns and cities have a street named after the civil rights leader and Dallas is no exception. MLK drive leads from Interstate 45 to the Fairgrounds and was lined with banners promoting events for Monday’s holiday. The street also passes other entities named for King – M.L. King, Jr. Recreation Center, M.L. King, Jr. Library, and most importantly, the M.L. King, Jr. Complex containing a tiny Civil Rights museum. 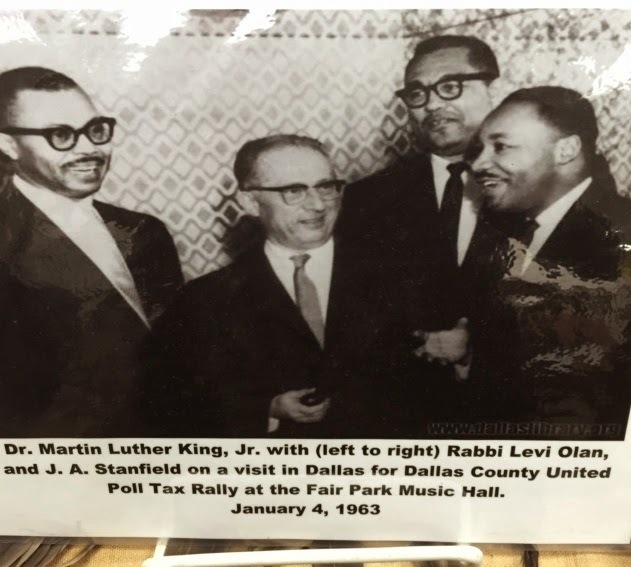 There we discovered a January, 1963 photo of King in Dallas with local activists gathered to protest the Texas Poll Tax. Texas was one of five lingering states in 1963 that still charged to vote - $1.75. Abolishing this tax was one of the major goals of King’s civil rights movement. Later that year, an election in Texas was held to do just that. Even with both parties supporting the abolition, the tax survived, thus requiring federal courts to strike down the law in 1966. Also in the community outreach center was a traveling exhibit called “the Pathway to Freedom”. Last year, a Freedom Ride Tour took 60 students and chaperones to Little Rock, Memphis, Montgomery and Selma in an effort to relive history and continue the legacy of Dr. King. As with any movement, it’s easy to become complacent and unappreciative of rights bought with blood. I’m sure Dr. King would be disappointed and sad to learn of the low turnout of African American voters in most elections. The Freedom Ride Tour is meant not only to educate participants of their heritage but also to encourage involvement in the ongoing need to protect civil rights. 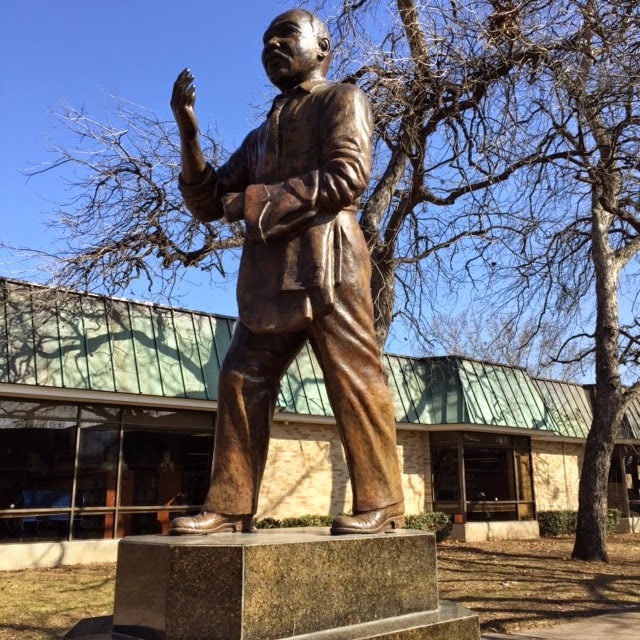 Outside the MLK Center, a larger-than-life bronze statue of King stands, depicting him in motion with his suit coat folded over one arm, the other arm upraised as if he were talking, convincing others of his cause. A local cause realized was the African American Museum on the State Fairgrounds. It is a beautiful structure with window and floor design taken from an Ethiopian church. Opened in 1993, its mission is to preserve visual art forms and historical documents that relate to the African American community. .The entry area drew in light from windows on two levels, lifting our eyes to the wooden circular roof, reminiscent of an African thatched hut. As a small time collector of folk art, I enjoyed the museum’s folk art collection that included works by Clementine Hunter. In the fine arts section, artist John Biggers is represented with a work I thought paled in comparison to his piece at the Paris Public Library. Most intriguing was the Freedmen Cemetery Exhibit that detailed a thriving black community near downtown from the Civil War to the 1970s. The highlight of our visit was time spent with LaToya M. Hobbs, an artist originally from Arkansas, currently living in Baltimore. Her solo exhibit filled one hall with large, strong paintings and collages of African American women, all known to the artist. 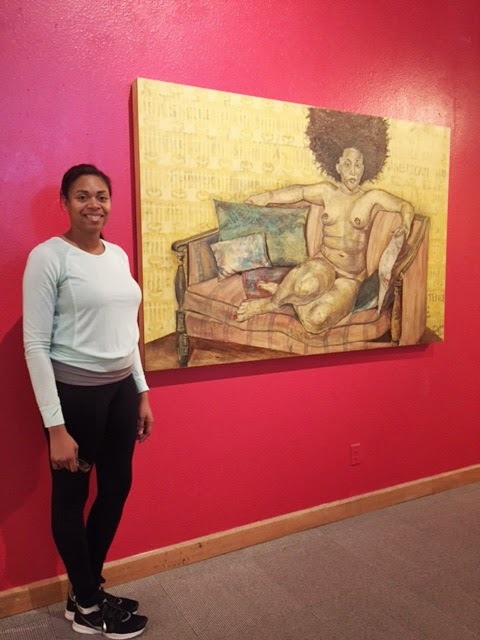 As Ms. Hobbs wrote, her works are “an investigation of the point where the notions of race, identity and beauty intersect concerning women of African descent. “ A particular emphasis was on the variety of color and texture of the subjects’ hair, a common discussion in her community. It pained her that women of color would still judge others by the tone of skin and texture of hair when all should be celebrating their diversity within the race. In the center of the room were stacked paper bags printed with answers given by her subjects to the question of the color of their skin – golden, chocolate, high yellow, caramel, dark chocolate, roasted chestnut, and bronze. As my companion, Sherry Scott, noted, Ms. Hobbs’ exhibit was the most politically charged experience we had as the artist continued Dr. King’s legacy of promoting respect for those different than you. The day ended as we explored surviving buildings near downtown that once housed parts of the prior African American community – The Grand Lodge of the Colored Knights of Pythia where George Washington Carver demonstrated his sweet potato products in 1923 to a crowd of 800, Booker T. Washington High School, for years the only black high school in Dallas but now a formidable arts magnet school, and St. Paul United Methodist church, long a political, cultural and social center. We could just detect the outline of the past African American community, now bisected by a freeway. It was a part of Dallas new to us and worth the time to explore. I just wish there were guided tours available. Maybe next time. 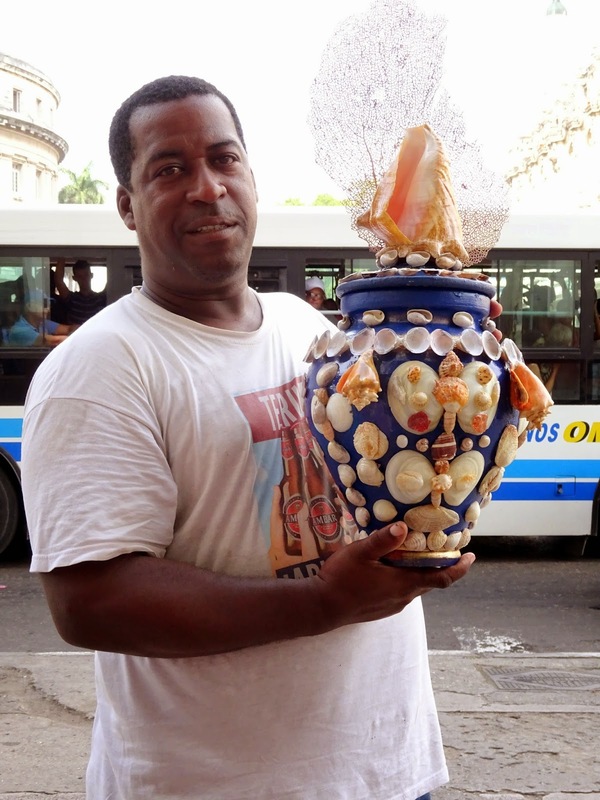 In Parque Central of downtown Havana, a young man of African descent carried a large blue ceramic jar decorated with shells and other treasures of the sea. Our guide pointed him out explaining the jar would hold the spirits of the Santeria religion, referred to by practitioners as Regla de Ocha or owner of heaven. We were to learn much more of this belief system during our visit. In Cuba, slaves’ African heritage flourished more easily underground. Up top, the bonded were required to become Catholics but in slave quarters, an African could maintain his old practice while recognizing its similarity to Christianity. A god from the old country often matched up with a saint in the new world. For those of Yoruba,Nigeria origin, a statue of Saint Barbara could double for an Oricha or deity from that region. By doing this, a slave would not be at risk of betraying Christianity while maintaining old beliefs. In fact, many saw no contradiction – just a parallel way of worship. Today, this double worship is most visible in Santeria, translated as a devotion to saints in Spanish. In the African community, the devotion is to Orichas or deities often paired with Catholic saints. There’s even a name for this weaving together of beliefs – religious syncretism. During a walking tour of the Vedado section of Havana, we turned down a residential street. On the stoop of one home, a handsome, gray haired man called out to our guide. They had worked together years before at a museum but hadn’t had much contact since. He invited us into his modest home for coffee – a time honored Cuban tradition. Julia Marino was excited for us to meet Larry Vives Lopez as he is a priest in the Santeria religion. Our plan that afternoon had been to visit the Yoruba Cultural Center to learn more of the Santeria gods and it was fortuitous to first meet a practitioner. Larry smiled easily and agreed to answer any questions we had. But first, he wanted to know our birthdays. Using a divination necklace, a priest can determine which deity is assigned to your day of birth. Both Larry and I belonged to Elegua, owner of the road, the first and last to receive homage, the one who shows a way home – very appropriate for a peripatetic wanderer like me who hoped for good travel karma. For my traveling companion, Tina Smith, her deity was the maternal Yemaya, a guardian angel and the one who was a grandmother over grandchildren – equally appropriate for a mother and grandmother of four and one indebted to a guardian angel. We were charmed by Larry and his son, also a priest, trained by his father. As a French professor, Larry’s work had waned in recent days, allowing him more time for his pastoral duties. He chatted easily of other American visitors, one of whom had bragged of having no problems. Larry sensed otherwise and was able to identify his marital discord without the man’s disclosure. The American was so amazed he went back to his wife. For Orisha followers, the home contains the altar. We again saw the ceramic jars on Larry’s shelves, holding his deity. When asked if a photo could be taken of him and his son, he permitted it saying he was more “liberal” than others. 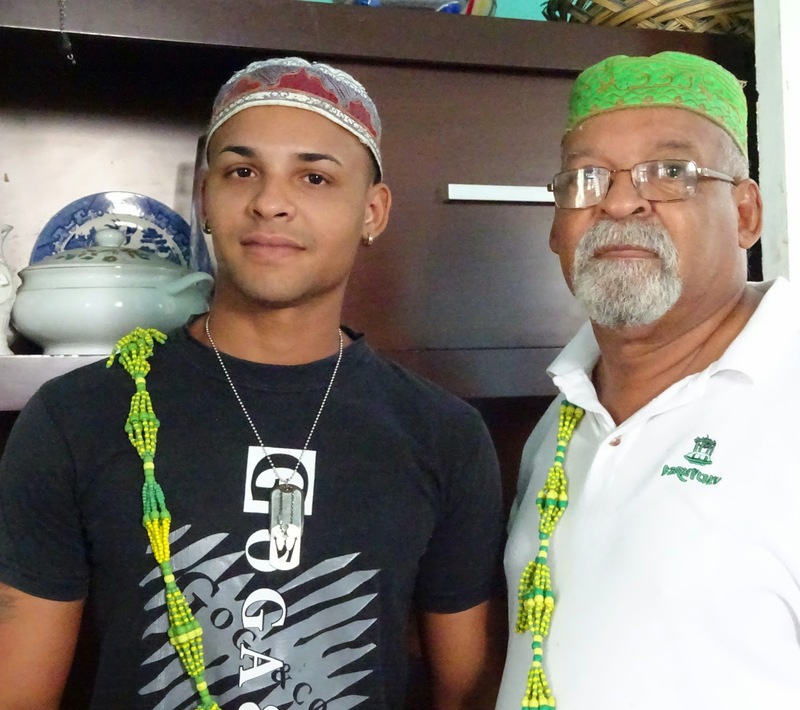 They put on their round hats and green and yellow beads representing Elegua, and posed with bright eyes but no smiles. They were leaving soon for a conference in Mexico to talk of their religion and Larry needed a ride downtown to check on his visa. The Cuban government had recognized practitioners of Santeria as a religion, making it easier for its priests to travel abroad. We were going to the Yoruba Cultural Center anyway and all squeezed into a taxi. On the second floor of the center, 29 of the 401 Orishas or gods were manifested by carved figures with explanations for the powers of each. In addition, many had references to the Catholic saint who most resembled the god. In front of some of the figures were baskets with offerings made by believers. No photos were allowed. 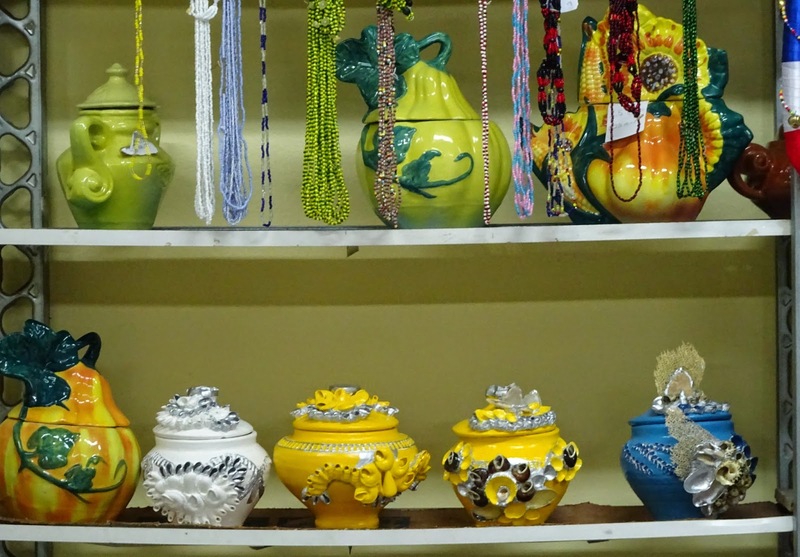 Downstairs, a store sold beautiful ceramic vessels, beads for the various gods, walking sticks wrapped in bright colors, dancing dolls and even a tapestry of the Virgin Mary. It was tempting to bring home the beads of Elegua but it didn’t feel right. They belonged with the believers of this historical religion, orally passed down by those who survived an ocean crossing and years of slavery. Larry Lopez was one of those and with his warm welcome and sincere sharing of Santeria, his beliefs won our respect.